Snap-on Smile® is a patented, revolutionary dental appliance that requires no tooth preparation, no injections and no adhesives. Its exclusive design is flexible, incredibly strong, and snaps right over a patient's natural teeth. 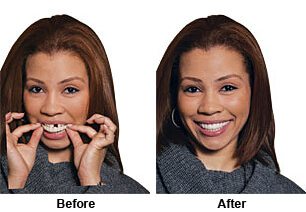 Snap-on Smile® is easily removable, completely reversible and is an excellent option for patients looking for a non-invasive, affordable approach to restorative and cosmetic dentistry. Call today for a consultation!